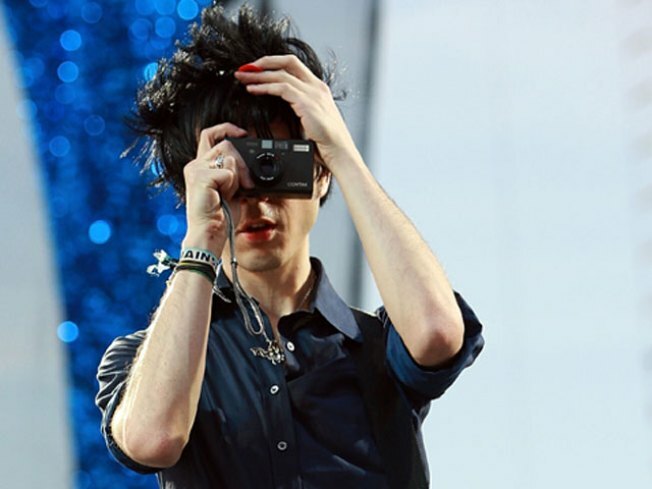 Multi-talented Yeah Yeah Yeahs guitarist Nick Zinner, discussing the photography in his new book at Barnes & Noble last night, said the 500 pictures in his portfolio -- and many in the book -- consist of crowd shots from concerts because the snapshots help him connect to the audience. “[The camera is] a way to keep them close," the soft-spoken musician said soon after taking snapshot of the Barnes & Noble audience in Union Square last night. "I’m pretty shy on stage, and I’m always playing an instrument, so taking pictures of crowds is a way of really kind of acknowledging that, being thankful for that, and also documenting that." Award-winning journalist Katherine Lanpher interviewed Zinner and two long-time friends, writer Zachary Lipez and graphic designer Stacy Wakefield, about their latest collaboration, “Please Take Me off The Guest List,” for the Union Square bookstore’s “Upstairs in the Square” series Monday night. The book combines Lipez’s humorous essays about New York City and Zinner’s photography while on tour with his band in a collage designed by Wakefield. The three complement each other socially as well as creatively. “Whenever we go out I’ll notice that me and Nick will sit at the bar and drink and Zach will always be working the room because he knows everybody there,” Wakefield told Niteside after the show. “Do you cut their meat for them, too?” Lanpher joked. The designer said she didn’t need to because the two boys are vegetarian. Before “Please Take me Off the Guest List” came into fruition, the three New Yorkers used to hang out at East Village dive Mars Bar, where Lipez bartended for seven years. Although they have different personalities, they all have the same taste in city hangouts. Lipez can’t stand clubs. Even with his slick black hair and cool hipster glasses, he often had trouble schmoozing his way around the line. “I would be [in line] for three minutes, and then I’d be like, ‘What the f--- am I doing?' It’s horrible. And that’s about as quintessential as my New York nightlife experiences get. I always had a good time, though,” the writer said. The YYY’s guitarist said that his friend’s misadventures was the inspiration for the title of the book. “It was going to be called 'Please Put Me on the List,’” Zinner said. “But then Zach got grumpy and changed it to 'Please Take Me off the Guest List.'"